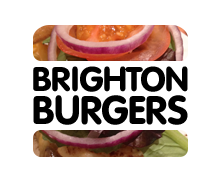 The first burger written for the blog to comprise lamb instead of beef as its main ingredient, and one that on paper sounded like a real winner, The Welsh Baaaarger from Kemp Town establishment The Mucky Duck was ultimately a bit of a mixed bag. Described as a ‘lamb, sautéed leek and thyme burger with grilled rarebit on top’ and to be fair, turning up to be exactly that, the end result was something that was a little underwhelming. It looked a bit spartan, the ingredients dwarfed by the seediest bun I’ve ever seen, ill-fitting like an overcoat several sizes too large. The atmospheric lightning didn’t help either; which is why these low-light iPhone shots don’t do the burger any favours either. As a venue, though, The Mucky Duck is a cosy little pub to while away an unseasonably cold March evening in. On the night of our visit, some of its clientele brandished banjos and exotic-looking dogs (I’m terrible with identifying breeds), lending the place a hipster vibe without any of the pretension that would normally entail. And what’s this? Kirin on tap? It’s been a long time since I came across a pub that serves the tasty premium Japanese beer, and its discovery set my expectations up another notch. My friend ordered the Dragon Stout burger, although no pictures survive before he utterly annihilated it – by all accounts, his was a tasty burger (locally-sourced minced beef marinated in Jamaican Dragon Stout, with onions, smoked bacon, cheddar cheese and a red onion relish). I would soon wish that I had ordered the same. Initial impressions count, and as mentioned above, The Welsh Baaaarger underwhelmed. Although I enjoyed the jaunty little flag poking out the top of the bun, I was alarmed by just how little ingredients seemed to be hidden in-between all that bread. This was mostly, however, due to the fact that the leeks and thyme were actually inside the patty. The lamb was indeed pretty flavoursome, flecked with those bits of green that gave it a distinctive taste. The rarebit on top was a squelchy mound of cheesy, mustardy pulp, the consistency of mashed potato. 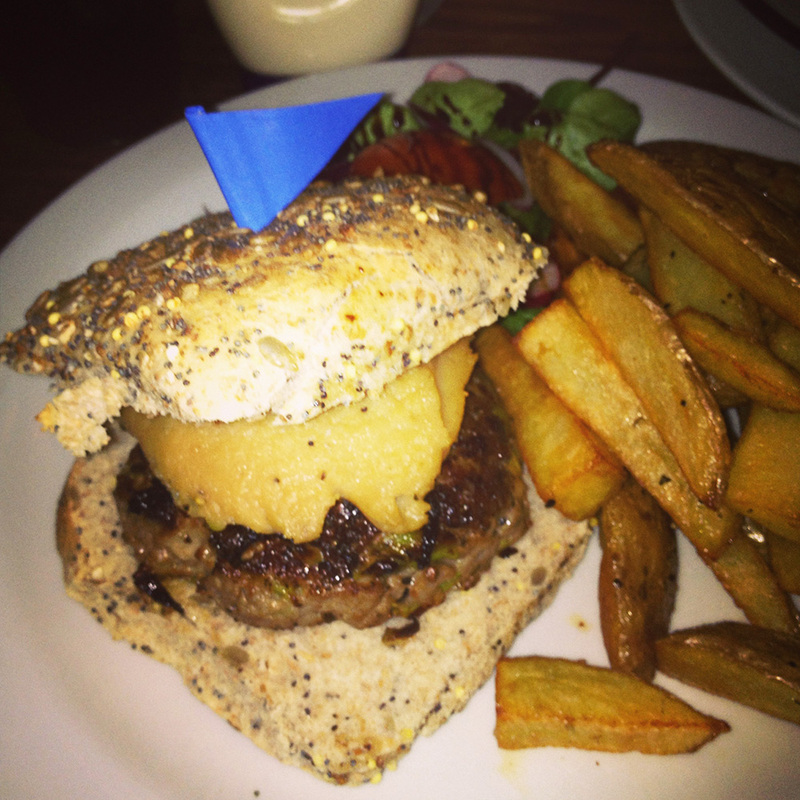 It was tangy and provided a good counterbalance to the meat, but overall it felt like it was out of place in a burger. The biggest drawback with The Welsh Baaaarger is all those seeds in that over-sized bun, which soon resulted in picking them out my teeth with tongue and fingernail long after the meal had ended. The saving grace of the meal, in truth, were the hand-cut chips that came included in the price and the smoked paprika onion rings, which were ordered separately. The chips were chunky and crispy, without any of the intense stodge lurking within that some homemade chips can suffer from. They were also good and hot – no lukewarm string fries in this meal. 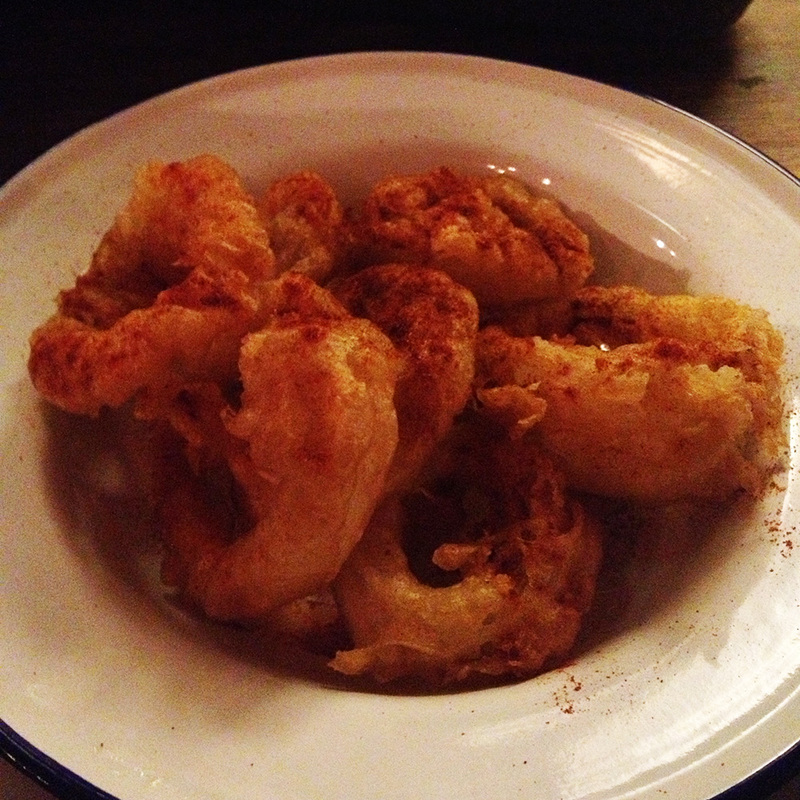 The onion rings were exactly as they sound – plenty of batter without overwhelming the taste of the onion inside, and liberally sprinkled with paprika, giving them a mildly spicy kick which worked surprisingly well. A simple addition, maybe, but a worthy one, and good value for the amount you get for the £3 asking fee. Perhaps I’m being a little harsh on The Mucky Duck. This was a tasty burger, and I’m a big fan of lamb. The addition of the rarebit is an interesting choice, but one which to my eyes doesn’t particularly work. There’s a reason you won’t have seen it elsewhere in your burger. But burgers are meant to be devoured with your eyes as much as your mouth, and I distinctly remember that little pang of disappointment as the server (a friendly chap who also served us that delicious Kirin) placed it down before me. Perhaps the Baaaarger would work better with those leeks piled high on top of the lamb, or be better served with that salad on the side of the plate being inside the bun, although I’m aware how considerate it is that it’s up to the customer to decide to put it in there or not. Personally, I’m too lazy for that. Ultimately though, I’d just change up that bun. It’s pretty much all I can remember.